Häggström, M; Stannered; Hoffmeier; Settersr; Richfield, D.
Häggström, M; Stannered; Hoffmeier; Settersr; Richfield, D (2014). "Diagram of the pathways of human steroidogenesis". WikiJournal of Medicine 1 (1): 5. doi:10.15347/wjm/2014.005. ISSN 2002-4436. https://en.wikiversity.org/wiki/WikiJournal_of_Medicine/Diagram_of_the_pathways_of_human_steroidogenesis. Wikipedia: Content from this work is used in the following Wikipedia articles: Cerebellum (Page views)See all. License: This work is released into the public domain by the copyright holder (under a CC0 license). This applies worldwide. Any person may use this work for any purpose, without any conditions, unless such conditions are required by law. Steroidogenesis is the biological process by which steroids are generated from cholesterol and transformed into other steroids. 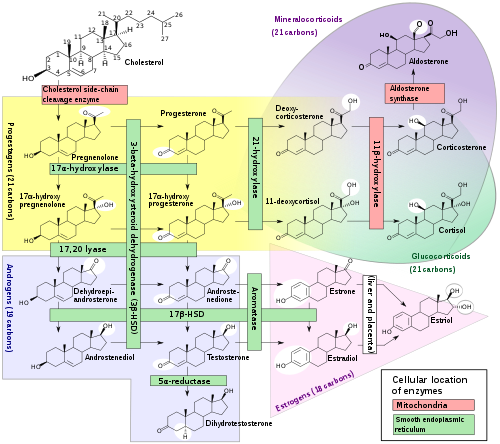 An overview of the pathways wherein these steroids are produced can be achieved by a diagram. Steroidogenesis is the biological process by which steroids are generated from cholesterol and transformed into other steroids. An overview of the pathways wherein these steroids are produced can be achieved by a diagram. The creation of a steroidogenesis diagram was essentially a work of multiple authors that was made available by the licensing of the images, that is, by GNU Free Documentation License and Creative Commons licenses. With these licenses, previous versions could be edited and improved without seeking written permission each time such an edit was made. Grouping into the major classes of steroids. This step used the textbook Medical Physiology by Boron & Boulpaep as reference, as well as for confirmation of existing molecular structures, enzymes, and products. In addition, for the absence of conversion of corticosterone to cortisol, it used a statement from the Kyoto University Bioinformatics Center that "there is no appreciable conversion of corticosterone to cortisol in the adrenal cortex as 21-OH steroids are poor substrates for 17-alpha hydroxylase." Also, group borders were made transparent between progestagens, mineralocorticoids and glucocorticoids, since many of the included molecules have activities associated with more than one group. For example, cortisol is a typical glucocorticoid, but also has affinity for the mineralocorticoid receptor, although this effect is minor in normal cases because of the enzyme 11β-hydroxysteroid dehydrogenase that breaks down cortisol in the locations where mineralocorticoids play the greatest role. Therefore, the mineralocorticoid field in the diagram also spans over cortisol, but shown in very transparent color because of the small effect. Likewise, corticosterone has strong affinity towards the mineralocorticoid receptor, and it also has an affinity towards the glucocorticoid receptor but this affinity is very weak, and therefore the glucocorticoid field only covers this molecule transparently. Addition of enzyme localizations, that is, either in mitochondria or in the smooth endoplasmic reticulum. This information was also taken from Medical Physiology. Numbering of the cholesterol carbons, as by convention that is seen for example in the textbook Principles and Practice of Endocrinology and Metabolism. Addition of white circles to indicate changes in molecular structure compared with precursors. Addition of stereochemistry specifications, that is, standard designations that specify how the atoms are arranged in three dimensions where there are several possible arrangements. The abbreviation HSD stands for "hydroxysteroid dehydrogenase". This diagram is an example in demonstrating the power of free licensing where anybody can contribute to making things better. Limitations of the diagram include the fact that there are many additional members of each class. Rather, only the most important pathways are included, in order to provide a model for the creation of the most important steroids, and the main mechanisms by which diseases arise from disturbances in these pathways. ↑ Hanukoglu I (Dec 1992). "Steroidogenic enzymes: structure, function, and role in regulation of steroid hormone biosynthesis.". J Steroid Biochem Mol Biol 43 (8): 779–804. doi:10.1016/0960-0760(92)90307-5. PMID 22217824. ↑ "Steroid hormone biosynthesis - Reference pathway (KO)". Kyoto University Bioinformatics Center. 2013-01-11. ↑ Clore, J; Schoolwerth; Watlington, CO (December 1992). "When is cortisol a mineralocorticoid?". Kidney Int. 42 (6): 1297–308. PMID 1474763. ↑ Funder, JW. (1997). "Glucocorticoid and mineralocorticoid receptors: biology and clinical relevance.". Annu Rev Med 48: 231-40. doi:10.1146/annurev.med.48.1.231. PMID 9046958. ↑ Schaaf, MJ. ; Cidlowski, JA. (Mar 2003). "Molecular determinants of glucocorticoid receptor mobility in living cells: the importance of ligand affinity.". Mol Cell Biol 23 (6): 1922-34. doi:10.1128/MCB.23.6.1922-1934.2003. PMID 12612067. ↑ Page 705 in: Becker, Kenneth L. (2001). Principles and Practice of Endocrinology and Metabolism. Lippincott Williams & Wilkins. ISBN 978-0-7817-1750-2.